Look at my work pictured above, in my portfolio and on instagram. What are you drawn to? Think about my style and how it relates to your vision. Submit a request for a custom commission. If you can, also email images of the space that you would like the piece to live in, and/or inspiration photos. I will work with you to finalize the design of your piece, including color scheme, size, mounting options and price. After you approve the design, I will send you an invoice for 50% of the total cost of the project. Then, I can order your materials and get to work! After your piece is created, I will send you an invoice for the final payment and we can arrange shipment, delivery or pick-up. If you need assistance installing the work in your home, we can arrange that. Bonus points for you if you send me images of the work in its new home! How do I begin a commission order? Start by looking at my work for inspiration. Take some photos of the space that you imagine the piece living in, and any photos that have inspired your idea. Submit a commission request so that I have all of the necessary information to provide you with a quote. After submitting the form, it is helpful if you also email me pictures of what you have in mind, inspiration photos, and/or photos of the space that the piece will live in once it is completed. The cost of a piece largely depends on the size and how complicated the construction is. After you submit your commission request, I can send you an estimate. 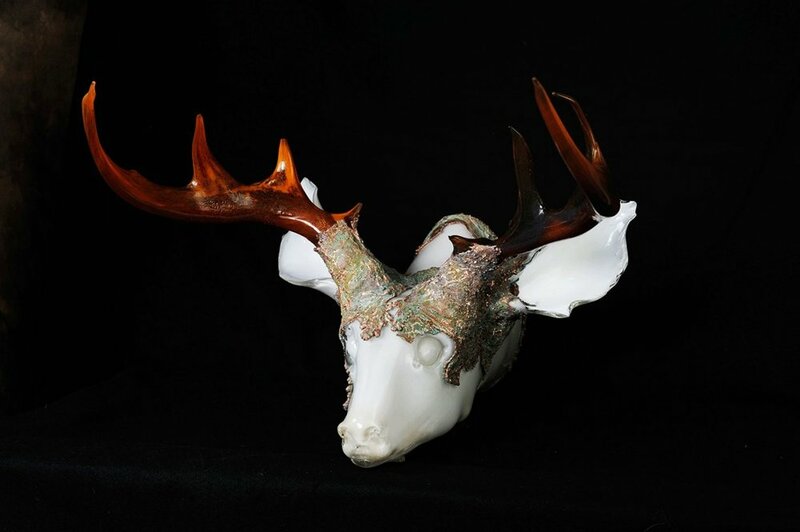 As an example, a set of custom antlers (as seen in my online store) are priced at $300. The larger, more complex works seen in my portfolio can range from approximately $2,500 - $25,000. After the design is agreed upon, you pay in two installments — a 50% deposit up front to begin your order & the remaining half when your piece is complete. Cash, check, credit/debit, paypal and venmo are accepted. In certain cases, I am able to accept monthly payment plans. For orders under $1,000, payment in full is required to begin your work. How long will it take to complete the commission? This depends on what it is, how big it is, how complicated it is, and what time of year it is. I’ve created pieces as involved as giant glass barrier reefs, to swimming schools of large glass dolphins, to custom antlers and small tusks. I like to have a six to eight week window to compete smaller, less complex works, and larger works may take longer. If you have a specific date in mind, let me know! Smaller work is typically double-boxed in cardboard boxes and shipped via Fed Ex. Larger work will be crated in wood and shipped by a freight company. If you're within a reasonable driving distance from Richmond, Virginia, I may be able to deliver the work in person. Of course, you can save on shipping fees if you'd like to pick the piece up from my studio yourself.